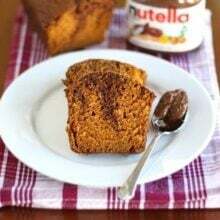 Earlier this fall I created fabulous treat, pumpkin Nutella bread. Pumpkin and Nutella are such a fine match-I just had to let them meet again. Last week I baked a pumpkin Nutella snack cake that is equally divine. 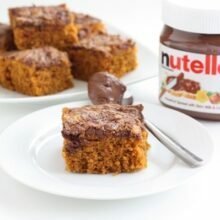 If you are looking for a new dessert to serve at your Thanksgiving meal, I highly recommend pumpkin Nutella snack cake. 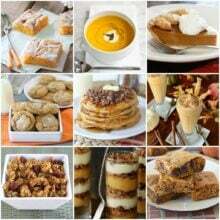 I am not a fan of most Thanksgiving foods, but when dessert time comes around, count me in! I like to have a little taste of everything. I like pie, but I also appreciate when there are other options, such as crisps, cobblers, or cake. This pumpkin Nutella cake is perfect for Thanksgiving because it contains pumpkin, is super easy to make, and will most likely steal the show. Sorry pies! You can never have too many desserts, so squeeze the Thanksgiving pies over and make room for pumpkin Nutella snack cake. It is sure to be a hit! 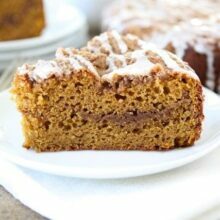 This easy pumpkin cake is a fall favorite. You will love the Nutella addition! 1. Preheat oven to 350 degrees. Spray a 9-by-13-inch baking pan with cooking spray. Set aside. 2. In a medium bowl, whisk together flour, cinnamon, nutmeg, baking soda, and salt. Set aside. 3. In the bowl of a stand mixer, cream butter and sugars until smooth. Beat in the egg and vanilla until well blended. Add the pumpkin puree. Reduce speed to low, and mix in the flour mixture until just combined. 4. Spread batter evenly into the prepared pan. Drop tablespoons of Nutella all over the pumpkin cake batter. Swirl in the Nutella with a knife. I wanted the Nutella to stay towards the top, to act as the frosting, so I swirled gently. 5. Bake for about 35-40 minutes or until the sides pull away from the pan and a toothpick comes out clean. Place cake on a wire rack and cool completely. Cut into squares and serve. I want some of this to snack on today! This summer I went to Europe for two months, and noticed EVERYONE there loves nutella. After one bite, I was hooked. My, my, this cake looks good. I must admit- I get bored of regular ole pumpkin pie- I like this twist. I am about to try to create a granola topped apple cake….I hope it turns out! If so, I will be bringing it to thanksgiving!! Looks awesome! Two of my favorite things together. how decadent! this looks soo good! Wow… this sounds absolutely divine. And it looks so moist and yummy!! Great job! This looks really tasty! I will be serving something similar for Thanksgiving! I just saw a Costco coupon for Nutella and was trying to convince myself to buy so much of it. Now I have the perfect excuse! Can’t wait to give this a try. Looking so yummy! I am such a Nutella fan! I am almost embarrassed to admit that I just ate a gigantic spoonful of Nutella about 3 minutes ago…it is my addiction. If there is any Nutella left, I just might have to give this a try today. I think this would be great on Thanksgiving morning!! Yum! This looks wonderful, Maria! I have a very similar cake post coming on Friday, but I could definitely go for a bite of one of your delicious cakes now! Thanks so much for sharing. I don’t think any woman in her right mind could pass up anything with Nutella, myself included. this looks sooooo good. You know me and nutella!!! Totally making this soon. This looks delicious. How can you go wrong with Nutella in anything?! Maria, what a fab twist on with Nutella and a seasonal one too! Make you want it to be autumn all year ’round. Pumpkin and nutella is a match made in heaven! I had a pumpkin brownie swirl mishap the other day that left me with some delicious pumpkin cake that I then topped with some nutella cream cheese frosting (amazing). next time, I’m just doing straight nutella! Yum! Can you believe I still haven’t tried the pumpkin Nutella combo? Seriously, what am I thinking? I just might have to break out my jar this afternoon and get baking. Looks fantastic! Could this look more delicious….I don’t think so!!! Yum! I think this has topped off your pumpkin nutella bread! nutella makes everything better…even the stuff that was already great! Mmmmmmm – delicious!! Love this combo!! See- you share dthis via stumble and I got it so now we need to show you…did you bring some nutella? Love this! I may bring this to a turkey pot luck my office is having Friday. Yum!! Yummy! I’ve got some sweet potato puree in the fridge. I’m so wondering if I could use that instead of the pumpkin. A chef friend told me you can’t sub pumpkin for sweet potatoes in a cake because pumpkin isn’t sweet enough. Now I’m wondering if sweet potatoes are ok to sub for pumpkin and maybe use less sugar if they are sweeter. Hmmm? Very tempting to try. ‘Course, I could just open another can of pumpkin. Let me know if you try it with sweet potatoes. I am sure it would be just as tasty! This looks delicious! I love, love, LOVE nutella!! It sounds like such a natural combination. This looks awesome! I really love the pumpkin/Nutella combo! I have a jar of Nutella in the pantry just waiting to be turned into this! Perfect! love love love this recipe! so creative! I love nutella and I am sure i would love this cake too. Looks so so good. 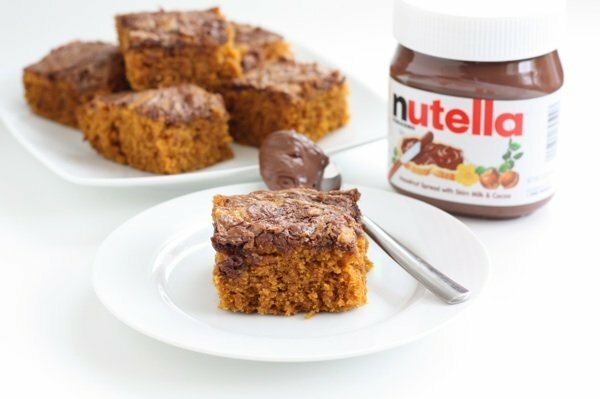 Nutella and a tender pumpkin cake – I really can’t think of anything better! not a fan of most thanksgiving foods?!?!? i’m shocked and flabbergasted! I made this yesterday, and my daughter and husband absolutely love it! I didn’t have enough Nutella, so I halved the recipe. I baked it in an 8″ square pan for 35 minutes, and it turned out wonderful. I was also out of ground ginger (it was one of those days! ), so I just deleted that and the other spices and used 1 tsp of pumpkin pie spice instead. I used a chopstick to gently swirl the Nutella around, because I wanted it more like a frosting like you did. 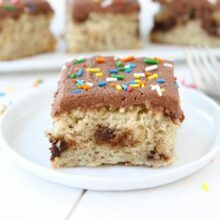 The cake is fluffy,moist, and the spices and mellow Nutella flavor go together perfectly. And it’s almost gone. 🙂 Thanks for the great recipe! I became a huge fan of Nutella the summer my sister came back from spain- she said she ate it everyday and lets just say that was not so good cause she came back 20 lbs heavier! Made this recipe today and WOW- it’s a keeper. Love pumpkin, lovd Nutella and love that it is something different than your typical pumpkin Pie. Thanks for sharing your talent!! I love nutella, but never thought about baking with it. I can’t wait to try this recipe out. It looks great! Oh! I like this cake with my favorite filling NUTELLA. Yummy! 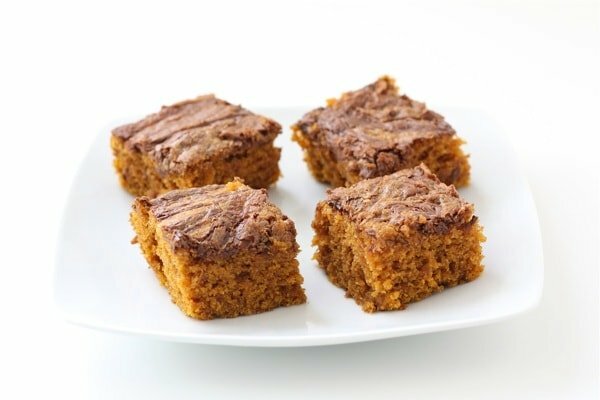 I know pumpkin cakes are delish and you can’t leave without eating a bunch of these cakes. This makes it awesome of the NUTELLA flavor. YUM! Mmm, I love how you just baked the Nutella right on top like that! I love this flavor combo too! I need to get on this pumpkin/Nutella combination 🙂 This looks delicious! I love nutella so will try this for sure! Happy Thanksgiving. So, so, so good. Just made it and I am definitely not waiting patiently for it to cool! Where does the ginger come in? I couldn’t find it in the grocery store (I live in the UK so everything is different) so I hope I can make these without the ginger. Combining two of my favorite things! This looks delicious – the pictures are so beautiful! This is great since it has my favorite filling! Nutella! I can’t rid of just looking your recipe I should really try this one. I made this and my family (some of which can be quite picky) ATE it all up! They loved it – I loved that they loved it and will definitely be making it again, and again, and again! Thank you for this yummy recipe!!! Oh. My. Goodness. 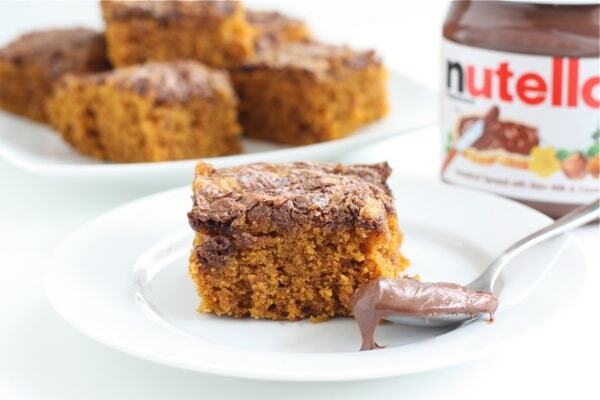 Pumpkin and Nutella…a match made in heaven! Hey! What size can of pumpkin are you using? You need one cup of canned pumpkin. A 15 oz. can is big enough, just measure out a cup. Well this definitely isn’t one of the fanciest desserts in the world, but it was definitely enough to satisfy the baking craving for me! It was very easy to make and I always love making swirl patterns on top of my cakes. I didn’t use the full cup of nutella on top because it was too much for me, but other than that, I followed the recipe to a T and it was great! Made this with my 7-year-old daughter who is a nutella addict. It was a hit all around and disappeared by the end of the day. Made these for Thanksgiving and they turned out great – moist, hazelnut-y and with a pumpkin cinnamon twist. On that note I added a lot more cinnamon (professed cinnaholic) and a teaspoon of ground cloves for an extra kick. I tried making this today, but it did not turn out well 🙁 It was cooked perfectly on the top and sides, but it was not done inside. I baked it for 50 mins instead of the required 35-40 mins. I’m not sure what happened. Followed the recipe exactly. If anyone has any input, I would appreciate it. Thanks. Just wanted to know how many grams is one stick of butter that you use?? I want to try this recipe as a two layer came using two round pans. Do you think that will work? This is the quickest easiest recipe and seems fool proof. All my kids request it for there birthdays and its a nice snack cake for lunch pails. A large can of pumpkin can make 3 cakes and usually I make all three in one week! My husband bought me the 11 pound jug of nutella from Costco 5 months ago just so I can make this cake. That jug is now empty!! This cake is that good!!! Also works great with leftover baked sweet potatoes. I just squeeze them loose from the skin and use inplace of pumpkin….its almost better this way!